The Road Movie seems like it belongs on a late night A&E marathon, tucked between episodes of Live PD. The film, spliced together footage from Russian dashcams, doesn’t have a plot to speak of, yet editor Dmitrii Kalashnikov manages to bring together dissonant clips in a way that makes sense. The success of this editing shows; the film received favorable reviews from RogerEbert.com and the New York Times, and appeared on The AVClub’s end of the year list of movies they didn’t review (but enjoyed). All of these reviews express similar feelings of discomfort and confusion at the wild series of events comprising the film, and each review took away different meanings from the connected footage. Overall, the film allows viewers to indulge in a type of voyeurism rarely encouraged while also peeking into the near past of Russia (most of the footage was shot between 2012-2014). Each segment follows a similar pattern that begins with the driver and passenger(s) chatting about the mundanities of everyday life or personal drama, then progresses to an extraordinary event (a car crash, a wild animal on the road, etc. ), then concludes when the car and its passengers are safe (or, sometimes, the clips abruptly end with no resolution). What’s perhaps the most interesting is the conversations at the beginning of each scene, when the dashcam records conversations that have no context for the viewer. One driver talks about how to slice a sandwich, while another talks about how wearing a sombrero in the car; a woman pleads with her husband to leave a dangerous situation for the sake of their children, a man brags over the phone about fighting on an overpass. The viewer never sees the cars’ occupants (except for the rare occasion when one gets out to move in front of the car), and we’re invited to imagine what their lives are like, what brought them to the Russian roadways, and what compelled them to turn on their dashcam in the first place. Insurance fraud is a huge reason for some of the more bonkers scenes in the film. There’s context here that some American viewers (like myself) don’t have. A quick Google search will tell you that Russian dashcams became popular because insurance scams and corrupt police--as well as just, well, crazy drivers. The Road Movie has plenty of wild drivers and pedestrians (one of which jumps onto a hood of a car and begins bashing his head against the windshield (potentially in the hopes of lying about the event and trying to file an insurance claim). The film doesn’t explain the history of dashcams in Russia, though, and it ultimately doesn’t matter to the rhythm of the film. There’s not much to be said about The Road Movie without spoiling the best parts, but one overarching theme of the film is that Russian drivers seem largely unaffected by the chaos happening around them. They speak to each other about massive wrecks calmly, drive through forests on fire, get in fights then casually drive away, and sit still as men intimidatingly swarm around the car. It’s baffling, and I’m not sure Americans would face these frightening situations with the same cool indifference. And that’s what makes The Road Movie fun to watch. The Road Movie has a sort of casual horror I haven’t seen before, a dismissive air that says the participants in the film don’t really care if they live or die. Because this movie is real footage, it holds the aching knowledge that these are real people, not actors playing a part. Real people who crash hard, slowly witness terrible accidents, and barely make it off the road alive. Somehow, that makes it all the scarier. 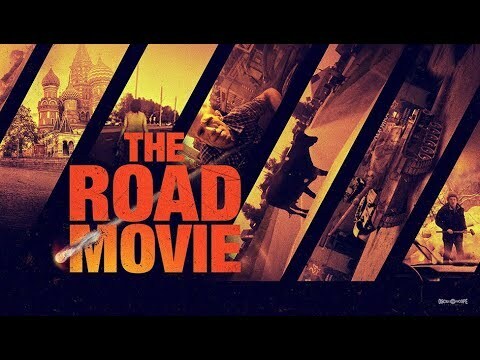 Watch The Road Movie (especially since it’s available for free right now via Amazon Prime), but know that you’ll watch it cringing in anticipation. This lady felt real chill as cars crashed around her.